From the very earliest days, we at Base Studios have been determined to ensure that our facilities are used to bring opportunities to the local community. Mostly focused on young, disadvantaged youths, there are a number of projects aimed at making music a central part of social and academic development. This programme was devised to engage young people in Dudley in challenging circumstances facing barriers to music making and musical progression, due to their life circumstances, behaviour and a cold spot of provision. Over an academic year running on Saturday mornings during term time, up to 20 young people were to cover an introduction to guitar , bass , drums, and vocals along with music technology. Through developing general musicianship, the young people are to work towards achieving a Bronze Arts Award in order to build a sense of achievement and accredited qualification. 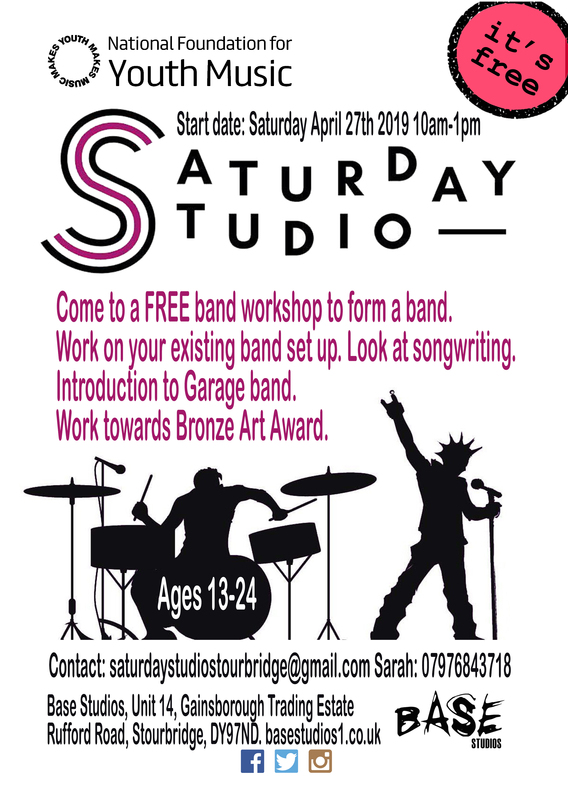 The Saturday Music Club is a “free to join” Big Lottery Funded programme designed specifically for young people (14-18) who do not normally have access to facilities to make, produce and record music. 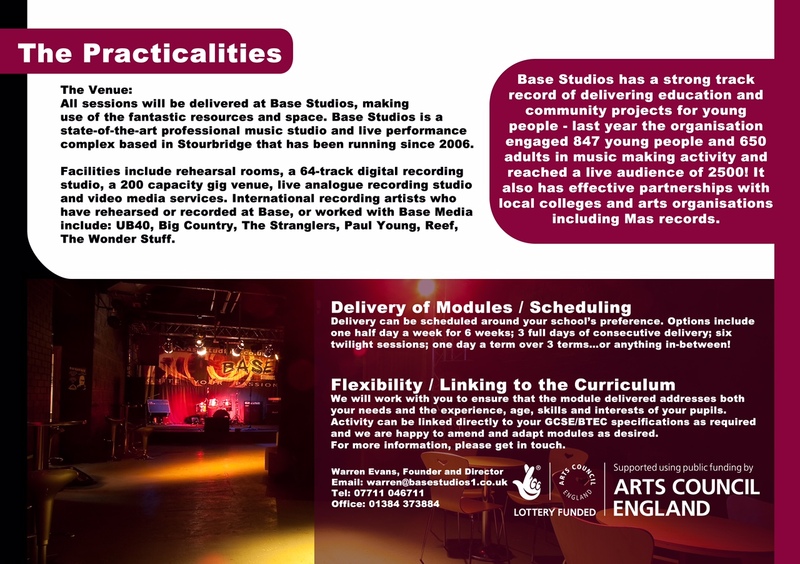 Base Studios has been running these sessions for a number of years with considerable success, and is open to people of any ability – from novice to experienced performers. The Base Complex is an ideal venue for such a project given that it enjoys the full range of services required, from rehearsal facilities, full digital recording studios, tuition, live venue and video production suite. Our Saturday Music Clubs have been a great success and we saw young people develop their talent while at the same time gaining a huge boost in self-confidence. We see music as an ideal platform for youngsters to develop in all areas of their life and we are proud of our involvement in this project. To teach musical instruments, such as guitar, bass guitar, drums and keyboard to a level whereby students can form a band and perform to their peers. This will be aimed at those children aged 18 or under, from low-income families or those with behavioral issues referred to us by the local police. Ideally they will already have an interest in being a band, possibly with basic knowledge of an instrument. Over a ten week period we will inspire up to 25 young people into learning the basics of their instruments and/or use of their vocals, from 10am till 3pm with two short coffee breaks and a half hour break for lunch. Sessional workers will be hired as teachers, all of whom will have an enhanced DBS check completed. They will be chosen based on experience and enthusiasm. The project is supported by the local police service. Each year, 2 bands will be created consisting of 10 young people, classed as disadvantaged, aged 14-18. The two bands receive a 3-hour evening session each week for 30 weeks with a professional musician who is experienced at leading band development projects. The sessions are to be used to work on instrumental skills, learning cover versions, writing their own music, recording their own music for a CD, performance skills, social skills and the organisational skills in how to continue the band after the project ends. Within each project year the bands will perform six times at the Base Live Venue, record their music and create a CD for distribution. In addition, each year, there will be two Trainee Music Facilitators recruited. Typically aged 18-25 with good musical skills, and an interest in forming a career around working with young people, they will be mentored by the Lead Music Facilitator on a weekly basis in order to support every band development session. 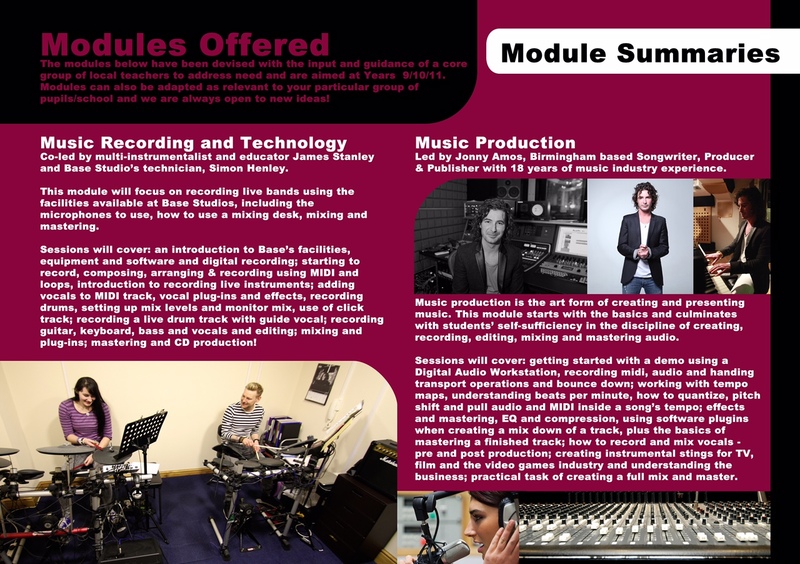 Each year, one signposting ‘seminar’ will be delivered with local colleges, schools and music industry specialists to enable young people to find out about and sign up for progression opportunities, and find out about the range of careers within music. Band Surgeries – this is for 5 existing local youth bands to book an hour slot with an experienced music professional to gain advice and guidance around the next steps for their band. It covers performance technique, recording feedback and marketing. A masterclass/discussion event with a profile musician using Base industry contacts – such as Miles Hunt and Brian Travers. This will give young people an insight into the music industry and Q&A. An open mic night where youth band or solo artists can perform and have feedback about their performance from a music professional. 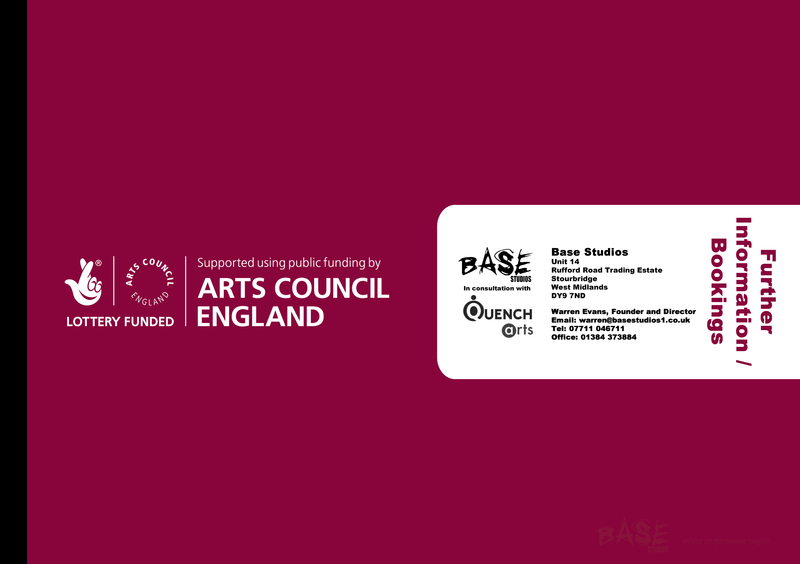 Base Creative Arts and Media CIC is a part of the Base Studio family and aims to develop relationships with 10 local schools so that the studio resources are promoted to the wider Dudley community. This scheme will ensure that we can engage more local people and create a sustainable model for the future development of our social enterprise. The Based Out project will engage 10 local schools which is typically up to 300 young people aged 11-18. The programme will consist of a series of ½ day taster sessions where a class of up to 30 young people can have access to professional studio equipment, design and marketing tools and multimedia equipment – learning new techniques, skills and possible career paths, increasing aspirations. The sessions will be led by 2 experienced facilitators. We believe that this fills a gap in provision as, due to the cuts, many music opportunities now cease to exist, such as Rock the Castle and Dudley’s Music and Dance Festival. Also, a reduction in youth services has reduced activity that young people can get involved in. By building relationships with local schools, we believe that this will lead to more young people accessing Base services, both through schools and through after school activity, ensuring young people have ongoing positive activities that they can access in a safe environment. We are currently developing a series of youth programmes for 2013 onwards so this taster activity will also be an opportunity to recruit and signpost local young people to Base, providing clear progression routes. Additionally, we are working closely with Dudley Music Education Hub to ensure that all activity is complementary to their work and additional to other offers. In particular, they see Base Studios as a way to effectively engage harder to reach young people and those with more of an interest in rock/pop/urban styles and music technology.